BOSTON – Yesterday afternoon I mapped out a backroad path from Exeter, N.H. to Salem, reminded myself not to tweet behind the wheel, and flipped on talk radio. What luck: Newt Gingrich was closing out his New Hampshire campaign by talking to Howie Carr. It was brutal: Twenty minutes of Carr demanding that Gingrich explain his newfound populist rage against vulture capitalism in his attacks on Bain Capital. “The guys on the top got all the cash, and the guys on the bottom got all the unemployment,” complained Gingrich. “Would you agree that capitalism is creative destruction?” asked Carr. Gingrich gave it his best (although listen to that link – he is audibly irritated by Carr’s leading questions) and went to his victory party. Carr, probably the most influential talker in New England, typed out his column. The only group that might want him as a speaker now is the Occupy Wall Street Alumni Association. What do you suppose the Union Leader thinks of its Newt endorsement now? First he doesn’t even show up in the Granite State for 15 days after he gets the nod, and then in the closing hours he morphs into a butch Arianna Huffington. Being gifted with an unnaturally long journalistic memory, I can remember all the way back to two weeks ago, when Gingrich professed deep, moral offense at the idea of a negative campaign. “Watch one of these negative ads with your grandchildren,” he’d say. “See if you’re proud of them.” So at some point, Gingrich is going to have an extremely awkward family meet-up at which his grandchildren watch a 27-minute documentary about Mitt Romney’s corporate perfidy, and some number of negative ads currently being planned for South Carolina. What’s he getting for all this? Well, in New Hampshire, 26 percent of voters – a plurality – said Gingrich ran “the most unfair campaign.” He didn’t have a single anti-Romney ad on the air. Voters were reacting to the Bain talk. 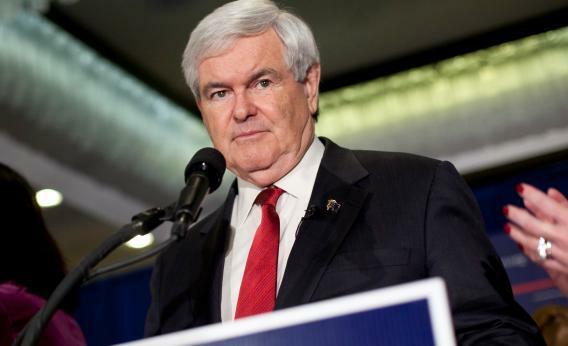 There’s no electoral upside, in a multi-candidate race, for Gingrich himself. He’d better believe in this.